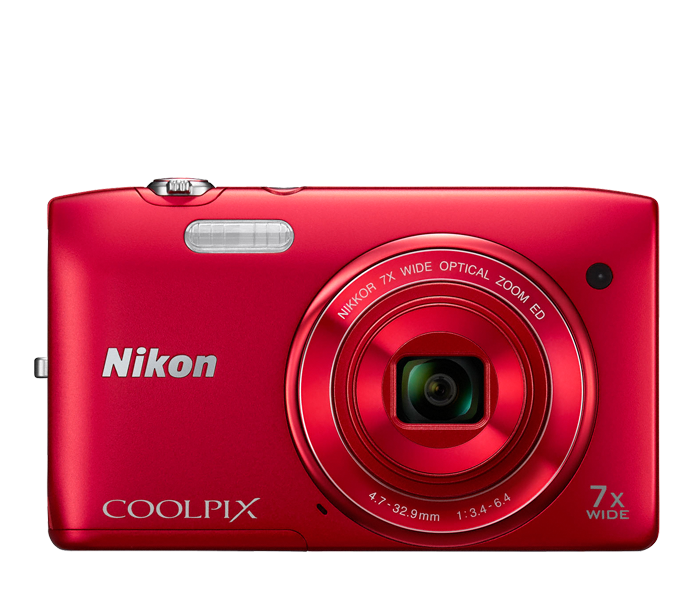 Take one look at the COOLPIX S3400, and you'll want it for its slim, stylish design. Take one shot with the COOLPIX S3400, and you'll want it for its beautiful 20.1-megapixel photos and dazzling HD videos. Sleek, pocket-friendly and very easy to use, it's a great balance of style and performance. Capture bright, detailed images with a powerful 7x optical zoom NIKKOR glass lens that goes from wide-angle to telephoto in an instant. Easily add fun and creative Image Effects to your shots—highlight one colour within a scene, give everything an antique look, soften the focus for flattering portraits and more. Carry the COOLPIX S3400 everywhere and start capturing the moments that matter with style. Create beautiful high-resolution photos and videos with ease. The COOLPIX S3400's high-performance NIKKOR glass lens is paired with a 20.1-megapixel CCD image sensor that captures bright, vibrant images you'll love sharing. Have fun with your shots! Turn everything black and white except a red hat with Selective Colour. Give a scene an antique look with Nostalgic Sepia. Shoot a video that makes everything look like a toy model with the Miniature effect and much more. Image Effects makes it easy to create exciting images without any additional software. *Based on Camera and Imaging Products Association (CIPA) standards for measuring the life of camera batteries. Measured at 23(-/+2)°C (73(-/+4)°F); zoom adjusted with each shot, flash fired with every other shot, image quality set to Normal, image size set to 5152 × 3864 (20.1MP). Battery life may vary depending on shooting interval and length of time menus and images are displayed.